Restricted Master Key Systems are an effective way to increase the security of your business, it achieves a very high level of key control with increase physical security. Restricted Master Key Systems offers the comsumer the saftey of knowing that in order to create a duplicate of these keys, the signature of the original customer is required. Restricted Master Key System is a tool to grant people access and deny access to others through doors. Xtreme Locksmiths can tailor a master key system on restricted locking profiles to maximise security over your key system. These restricted master key systems can be as small as two different keys working one door all the way through thousands of keys working thousands of doors and locks. so no matter of size of your business, we can design a system that enables you to manage access to all areas. Example: master key system (general main group key system) for an office building used by two companies, Smith Ltd. and Jones & Co. 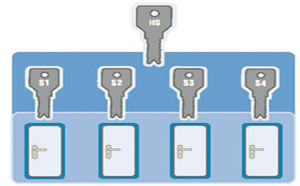 The following overview shows clearly the four different master key systems. Your EVVA/Aldridge support team or EVVA/Aldridge partner will be glad to provide you with information as to which type is perfect for your property. The general main group key system. 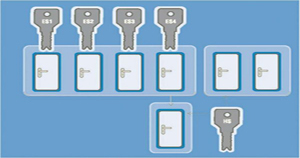 Several main groups with subordinate group and own keys are combined under a general master key in accordance with the hierarchical structure of a company (for complex organisation such as administration and infrastructure companies, industry, etc.). For housing developments for example. Individual flats have different locking cylinders. Each flat resident locks the flat and the main entrance door with his/her key. A master key can also be provided which locks all engineering rooms. In addition to the mechanical master key system, doors are also protected with an electronic locking system. The mechanical, and also electronic locking system, can only be operated by the user with an ID (combination key).